Work out like a dancer! Fletcher Dance Conditioning at Boditree Pilates is a dynamic and energetic workout integrating Ron Fletcher principles, exercises, and breath work blended into a full body workout using the mat, the floor, and the ballet barre. Be prepared to work hard, you will leave feeling immense strength and length, and you will work up a sweat ! Ron Fletcher was trained directly by Joseph and Clara Pilates and was a Martha Graham dancer and choreographer as well. His work is the result of the blend of his experiences both in Pilates training, dance conditioning, with a focus on breath work. Pre-regisration is required for attendance as spaces are limited. No drop-ins permitted. Classes run for 10 sessions. Come for one class or register for 5 or 10 classes to feel the full benefit! Risa Mathews of Boditree Pilates will be presenting workshops at Rolates Pilates in New York City on March 23 & 24th, 2019! If you are in New York this is an opportunity to meet and learn from Risa in this beautiful studio! The studio is conveniently located steps from Columbus Circle at 939 Eighth Avenue between 55th and 56th Street. workshop will leave participants with a new assortment of tools that will enrich their client’s physical experience of the work. Pilates can be very hard for someone who is suffering with pain. By integrating Boditree Releasework into your practice, your clients will have greater ease in establishing the connections needed for executing control of the classical repertoire. At Boditree Pilates & Healing we are pleased to announce that we have a new partner in our spacious treatment room… it is Marjorie Walker, Physiotherapist and Pelvic Health Specialist! Physiotherapy and Pilates are natural partners, working together to create results more effectively! We are very excited to have Marjorie on board and look forward to 2019! Remember, our facility has free on-site parking for you as well as a wheelchair accessible entrance and elevator. We are also within one block of the transit stop at Broadway and Maple. Knowing no single approach is the right one for every individual, Marjorie has travelled the world studying and learning how to be the best therapist she can be in order to indulge her passion for helping others. Marjorie graduated with a Bachelor of Science in Kinesiology from the University of Calgary in 2008; graduated with honors in a 4 year Physiotherapy program at Auckland University of Technology in New Zealand. Marjorie is currently in her 3rd year at the Canadian School of Osteopathy-Manual Practice-Vancouver Campus. This is a 6 year program to become an Osteopathic Manual Therapist (D.O.M.P). New group-led classes at Boditree for 2019 !! By registration only, spaces limited ! a dynamic and energetic workout integrating Ron Fletcher principles, exercises, and breath work blended into a full body workout using the mat, the floor, and the ballet barre. Be prepared to work hard, you will leave feeling immense strength and length, and you will work up a sweat ! a comprehensive workout that will teach the critical aspects of Pilates and integrate them into a fluid hour of exercise. 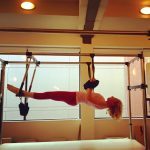 Integrating the classical Matwork with classical and modified Reformer exercises, this workout will ensure the participants experience the Pilates Method from a place of structural integrity, controlled movement, and the power of breath. Strengthening core, pelvic floor, and quality of movement, you will leave this class feeling a foot taller ! an intermediate workout seeing integration of Fletcher Floorwork and Fletcher Barre sequences with classical Intermediate Reformer exercises. A dynamic workout that will ensure you feel every muscle in your body working in harmonic symphony with breath. Pre-regisration is required for attendance to all group-led workouts as spaces are limited. No drop-ins permitted. Please provide 24 hours notice for all cancellations. You have heard of Pilates but who designed it and where does it come from? What can it do for you? Is it suited to your needs? Start off by exploring and gathering information about Pilates and take a look at who, besides celebrities, is using this amazing system of exercise to support their sport, art or well-being. Here is a little reading tour to start your journey. Find out how even the most fit and athletic person needs the specific core training Pilates provides so well. Learn about how any one, regardless of age and physical limitations can benefit from Pilates. Here are a few links to begin your journey! When you are ready, give us a call and we can start together! Need an eco-friendly gift this year? Why not give the gift of Pilates at Boditree Pilates and Healing! Pilates is perfect for all ages and is a really great idea for people wanting to improve in their sport or to work on an injury or functional issue. A great gift for anyone new to Pilates would be our Intro Package for 4 private sessions at $330. Within the initial session, we get to know our new client and discuss their needs and anything they would like to work on. In the same session, we will begin to determine range of motion, flexibility, and potential muscular and skeletal imbalances. The instructor will create a customized program for based on the intial session and then be there for the remaining one on one sessions to guide and assist. Call us at 604-736-2634 or email us at boditree@telus.net for more information.